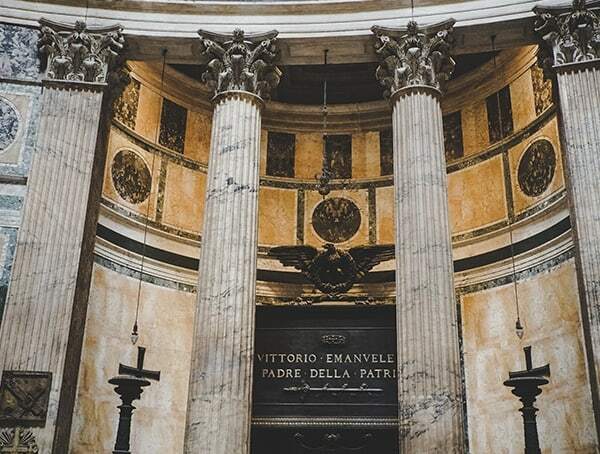 The Pantheon is a former Roman Temple, which now functions as a Christian church, the church of Santa Maria ad Martyres. 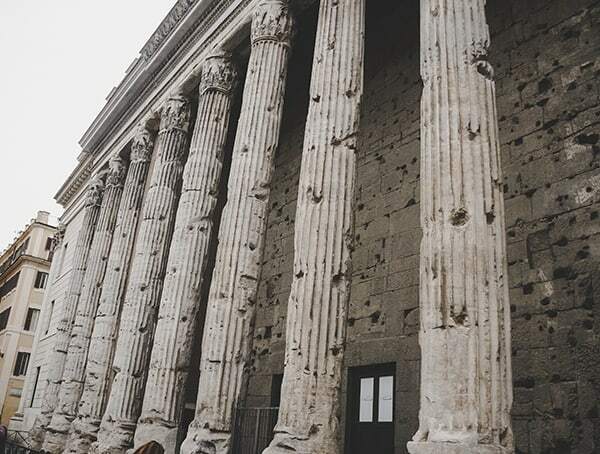 This building was built centuries ago but remains in use as one of the greatest preserved of Ancient Roman buildings. 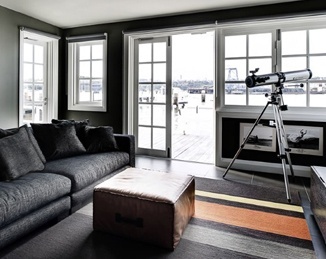 This is likely due to the building being in continuous use since its inception. 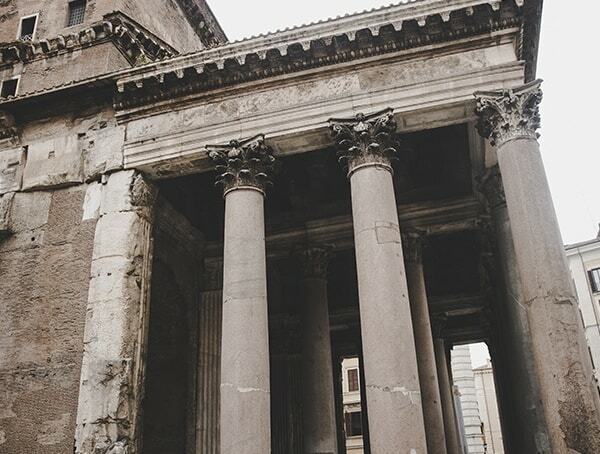 The Roman Pantheon still serves as a popular structure in Rome today. The surrounding piazzas are busy and full of people sightseeing or enjoying a meal at all hours. 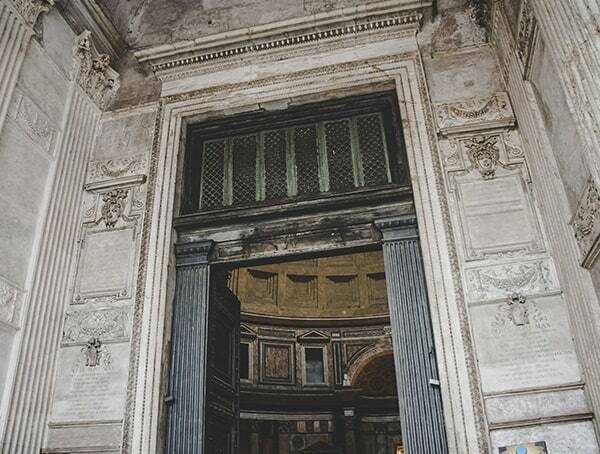 The imposing building that is the Pantheon features a granite portico holding a triangular pediment leading to a rectangular vestibule and finally leading you into the rotunda. The portico includes sixteen Corinthian columns, eight in the front with two rows of four behind, leading back to the large bronze doors. Originally, the portico was approached by a flight of steps, however at one point the ground level was raised to meet the structure. The bronze doors leading into the building weigh a combined total of 40 tons and were once covered in gold. 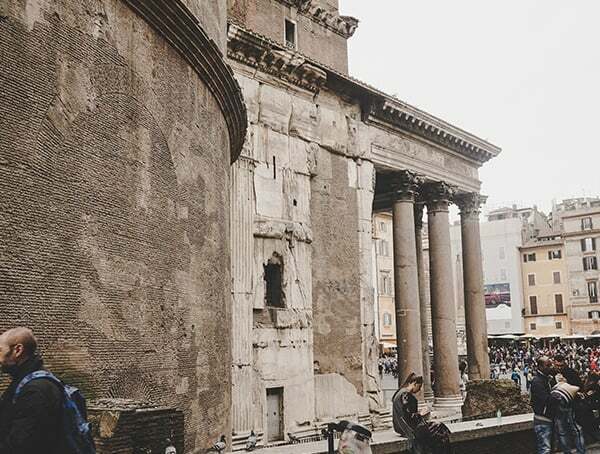 The inscription on the pediment reads “M AGRIPPA L F COS TERTIUM FECIT” meaning “Marcus Agrippa, son of Lucius, during his third consulate, built this.” The pediment leads to a rectangular vestibule, and then the rotunda. 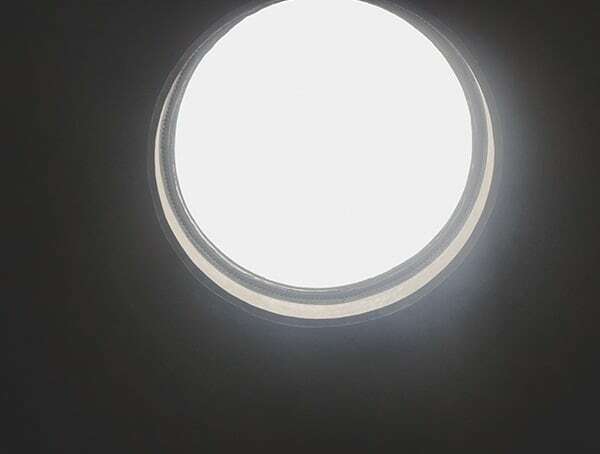 This round room features a coffered concrete dome leading to an oculus in the center to allow sunlight to enter and smoke to exit. The oculus is a circular opening in the center of the dome, in this case measuring 27 feet across. The floor within the rotunda is slightly sloped to allow any precipitation to runoff. The walls of this structure are 25 feet thick. 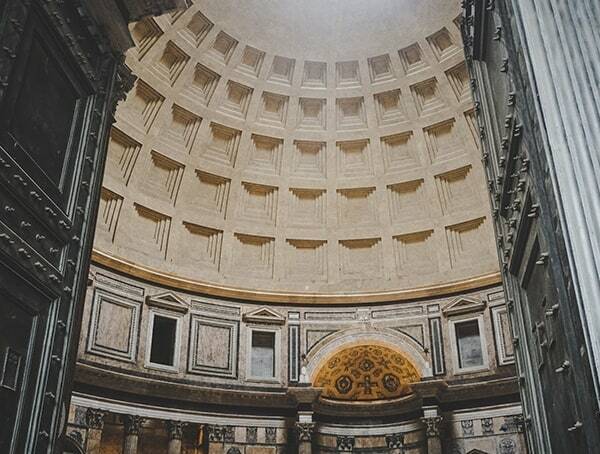 The distance from one side of the rotunda to the other is the same as the distance from the floor to the oculus, 142 feet, creating a perfect sphere resting in a cylinder. 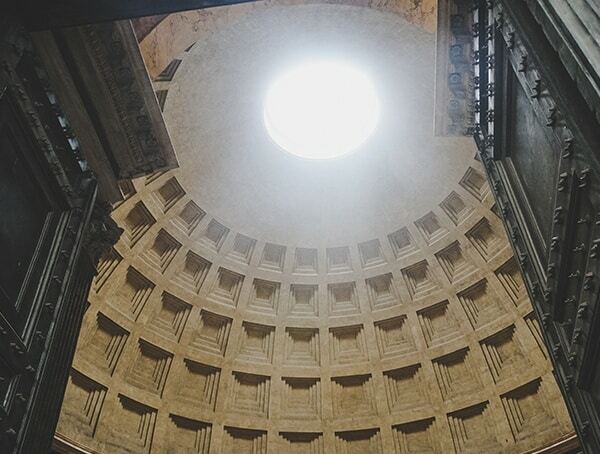 Even today, this dome stands as the largest unreinforced concrete dome in the world. Outside the Pantheon within the Piazza della Rotonda is a fountain adorned with an Egyptian obelisk. 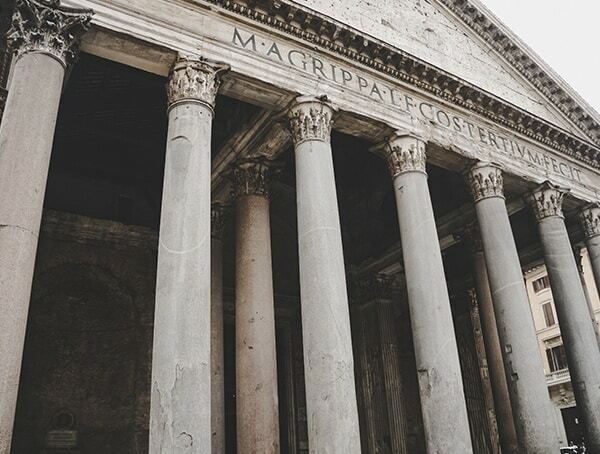 Initially, as the inscription suggests, magistrate Marcus Agrippa built the Pantheon around 26 BC. This was in commemoration of the victory of Actium over Antony and Cleopatra. This original temple burned down in 80 AD. 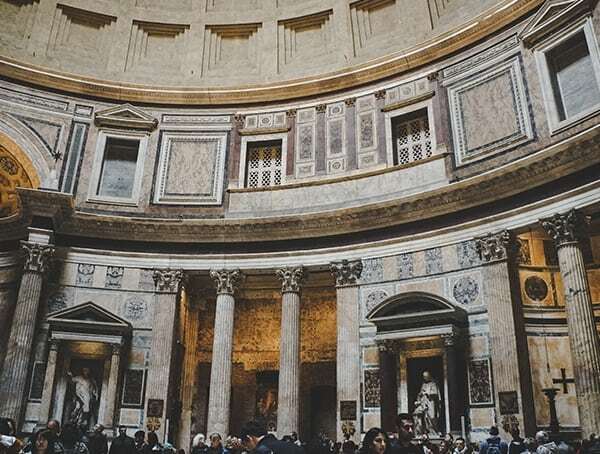 In 125 AD the Pantheon was rebuilt by the emperor Hadrian. The dedication for this version of the Pantheon read “pan theos” or all the gods. This building was used and maintained through time, this included restoration by emperors Septimus Severus and Caracalla. During this period, the structure was adorned with statues of gods whereas the center was reserved for animal sacrifice and burning. In this case the oculus served as a portal for the smoke to escape. 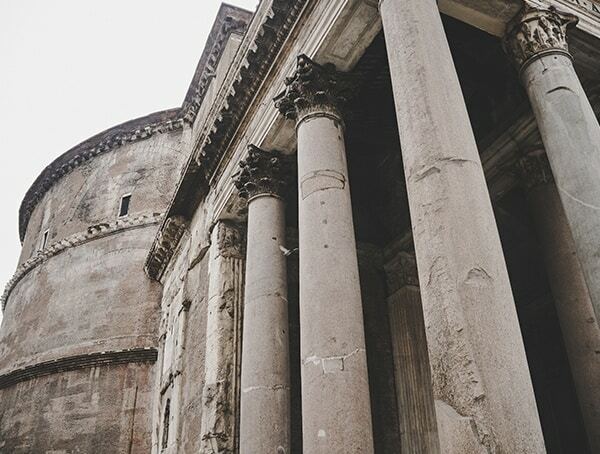 However, once Christianity replaced Paganism in Rome, the temple fell out of use for a time. 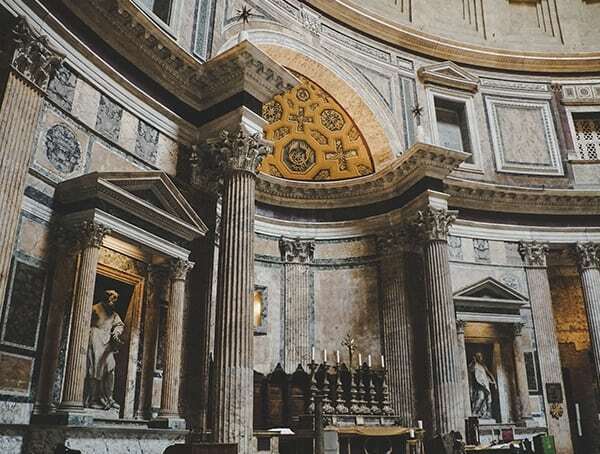 The Pantheon was eventually repurposed as a Christian Church however, beginning in 609 AD. This was the first Pagan temple in Rome to make this transition, though this was more common elsewhere in the world. It was at this time that the structure was rededicated, this time to the Virgin Mary and all of the martyrs. Also as a part of this transition, an altar was placed opposite the entrance under icons of the Virgin and Child. 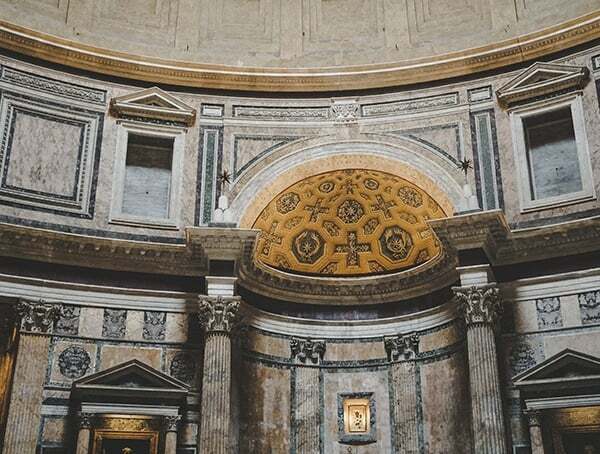 The year 667 AD brought more adversity to the Pantheon, when it was stripped of golden roof tiles and looted for anything else of value. Pope Benedict II had the church somewhat restored, but it was robbed several more times between restoration attempts. 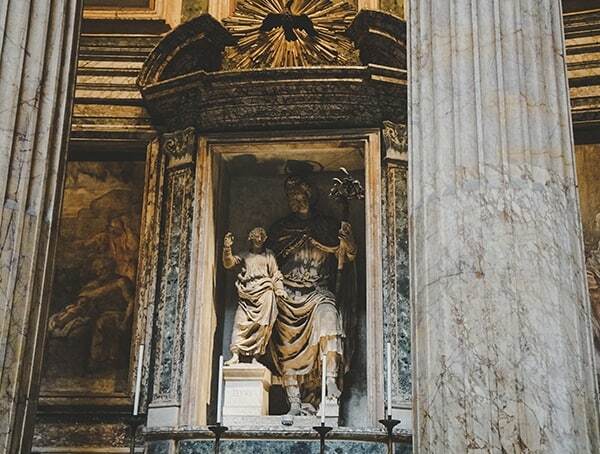 Michelangelo di Lodovico Buinarriti Simoni, commonly known as simply Michelangelo, visited the Pantheon to study the impressive dome before beginning work on the dome of St. Peter’s. The fountain located outside of the Pantheon in the Piazza della Rotonda was added in 1575. In the nineteenth century, this area was a well- known bird market, where flowers, fruit, vegetables, and cakes were also sold. Fountains in this ancient city were used as a source of drinking water for the public, and this one, the Fontana del Pantheon, was built as part of a water distribution project. Pope Clement XI added the obelisk called Obelisco Macuteo to the fountain in 1711. This obelisk was one of a pair, which originally sat at the Temple of Ra in Heliopolis. 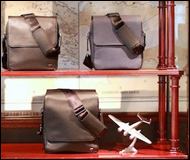 It’s twin is located in the Piazza della Minerva, positioned at the back of the Pantheon. Obelisco Macuteo is so named because it was originally placed in the Piazza di San Macuto, which is about 200 meters east of the Pantheon. Today when you enter this structure the main church altar sits opposite the entrance, with the original icons of Madonna and Child above. This icon was recently dated back to the seventh century after layers of overpainting were removed, adding six centuries to its perceived life. The apse is decorated with a mosaic featuring crosses of gold. There are also frescos in the rotunda that date back to the fifteenth century. 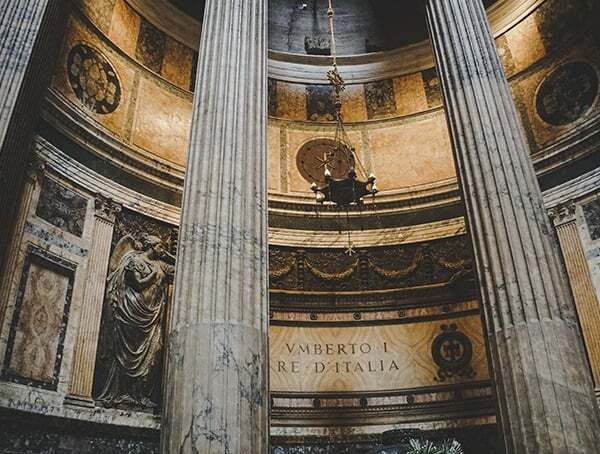 Set into the walls of the Pantheon are monumental tombs, including that of the artist Raffaello Sanzio da Urbino, known as Raphael. 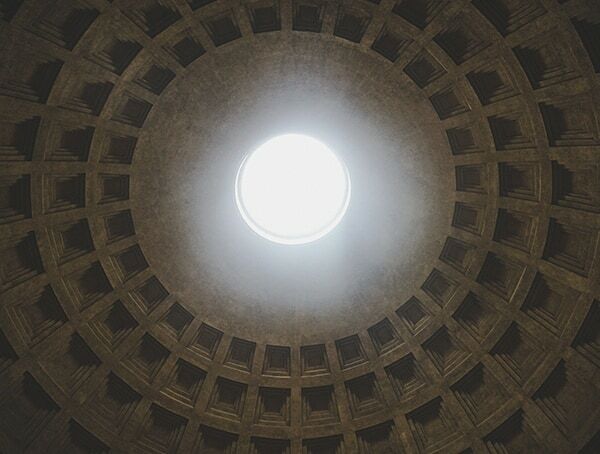 The Pantheon is open to visit Monday through Saturday from 8:30 AM to 7:30 PM. 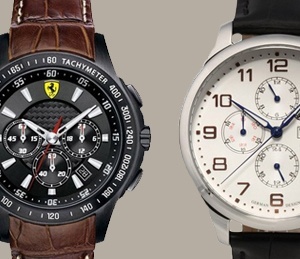 Sunday hours are slightly shorter, opening at 9:00 AM and closing at 6:00 PM. 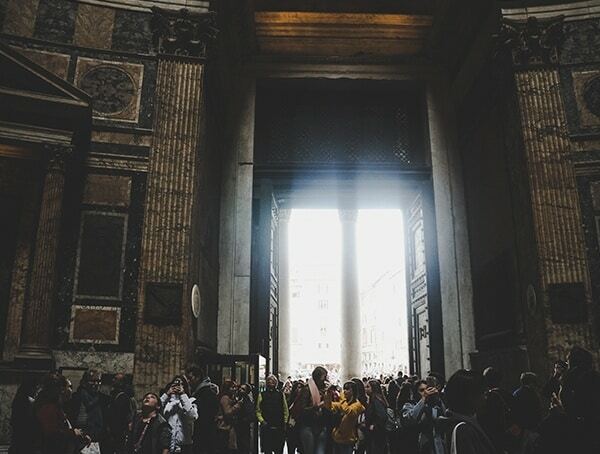 The Pantheon is closed on January 1st, May 1st, and December 25th. On other public holidays, the site is open from 9:00 AM to 1:00 PM. Last admission is always 15 minutes prior to closing. 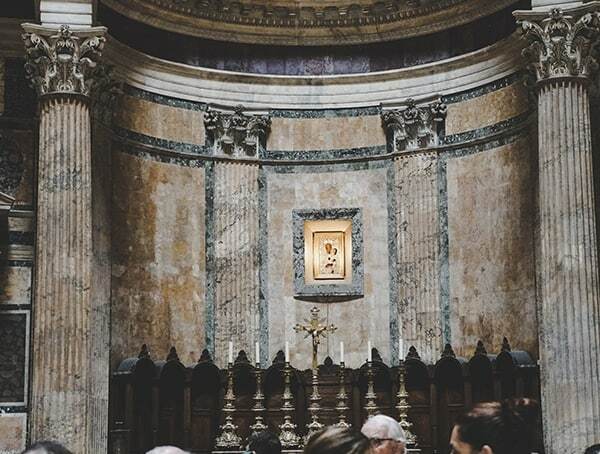 Masses are still held here at 5:00 PM on Saturdays and 10:30 AM on holidays, visitors are prohibited from visiting during this time. As far as the wait goes, we were easily able to walk right up and entry without having to stand in line. 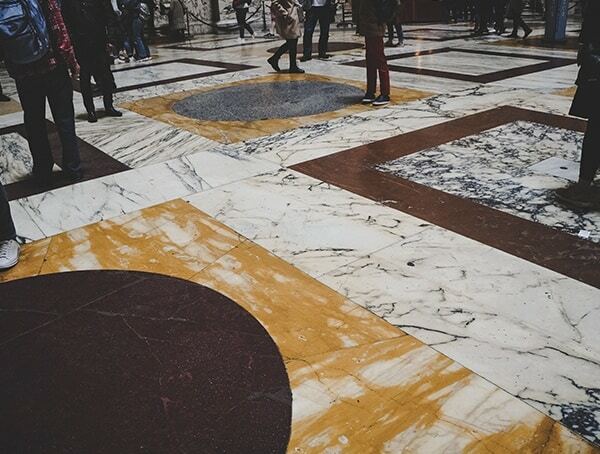 Due to the sheer interior size of the Pantheon, it accommodates large groups and crowds fairly well. 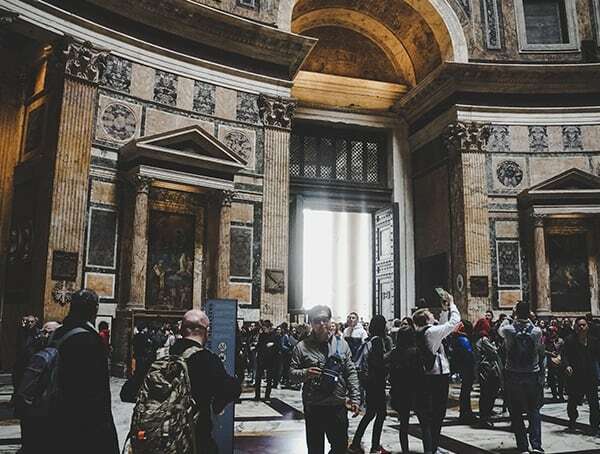 Since the Pantheon is a functioning church, it is important to remain respectful during your visit and to dress appropriately. Signs ask for silence at all times, but photos are allowed. Appropriate dress for visiting a church such as this is to cover your shoulders and knees, and wear shoes. Hats are also customarily removed. Sandals, jeans, and capris are fine; just stick to the guidelines above. 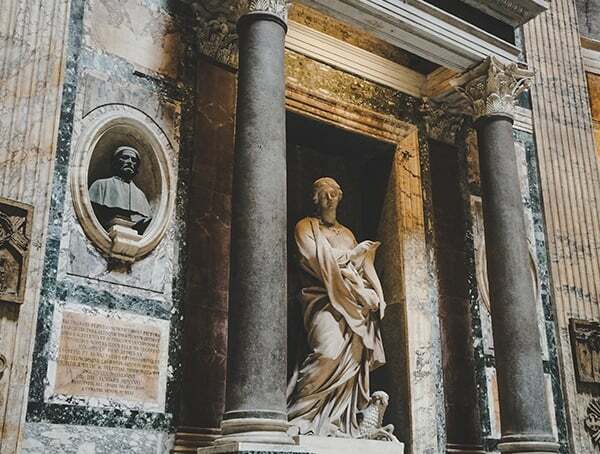 For women a good idea is to carry a large scarf to throw over your shoulders if it is a warm day, this can be additionally helpful for those cooler Rome nights. 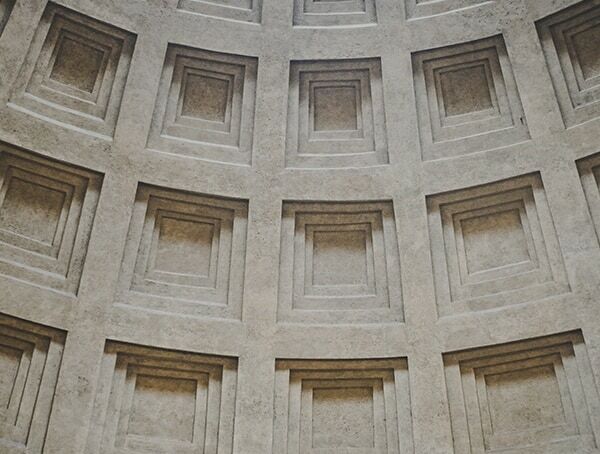 Many buildings were inspired by the design of the Pantheon through time. The British Museum Reading Room, Low Library at Columbia University, the State Library of Victoria in Australia, and Thomas Jefferson’s Rotunda at the University of Virginia are a few examples of this influence. 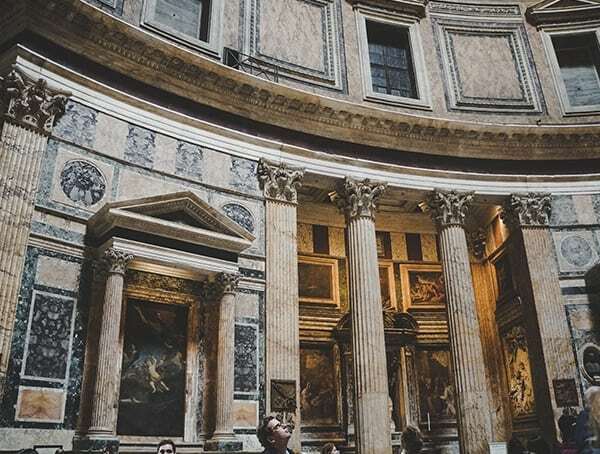 Because this structure has been in use, and has remained standing for so long, it has indirectly influenced many government and public buildings like university buildings, libraries, and city halls. This particularly can be seen in the adoption of the portico and dome. Nevertheless, seeing the real thing cannot be compared. 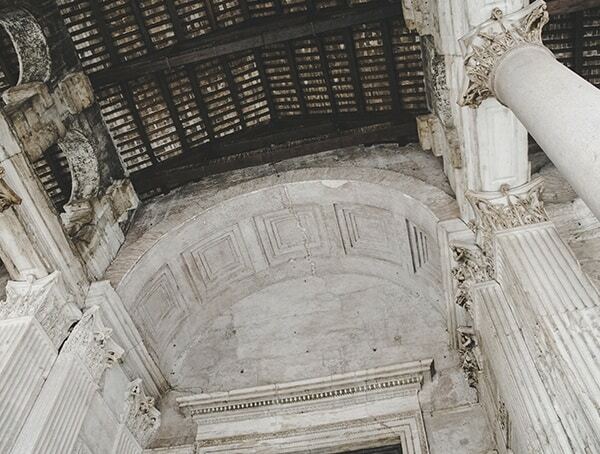 This structure truly captures the grandeur of Rome both ancient and present day.